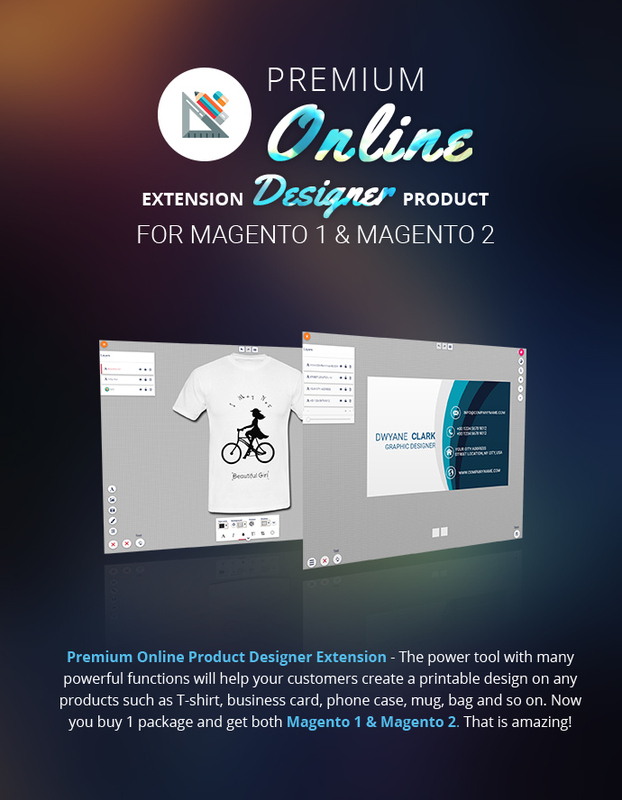 Online Product Designer Extension For Magento 1 and Magento 2 allows your customers quickly create an amazing online customizable design for any items on your Magento site. Not all customers can use the design software as Photoshop to create a custom design as their expectation. Don't worry! Your wishes will become easier with Online Product Designer Extension For Magento 2. This power tools with function as add text, add art, add the image, free draw, add QR code and much more feature that helps your customers create a printable design on T-shirt, business card, phone case, mug, bag and so on. + Give a complete solution for the printing business. + Can integrate module for any products you want. + On/Off functional: add text, add art, add the image, add QR code and free draw. + Upload the product images for design and customize product size and design area size in "manage designs" in the back-end. + Manage the design templates as add, edit and delete them in the back-end. + Manage the fonts as add, edit and delete Google Fonts and Custom Fonts (file .woff and .ttf) in the back-end. + Manage colors and clip art as add, edit and delete them in the back-end. + Manage orders that included the design in the backend: View design, download design, approve or reject design, output PDF. + Allow shop owner approving the customer design in the detailed order. + Easy to install and configure. + Improve shopping-experience on your store site. + Easily create the customizable design for any products as your expectation. + Allow customers using the design tools as add text, add clipart, upload images (from the local computer, Facebook, image URL and Webcam), free drawing and add QR code to design. + Preview design after completing design with the preview function. + Customize layer with the adjusting layer. + Save customized design in customers account. + User-friendly interface for faster design. + Convenient design with any devices as tablet or mobile. Step 1: Go to the product detail page and click on "Start Design" button to start design for this product. Step 2: Click on Helpdesk to understand about the function of Online Design. 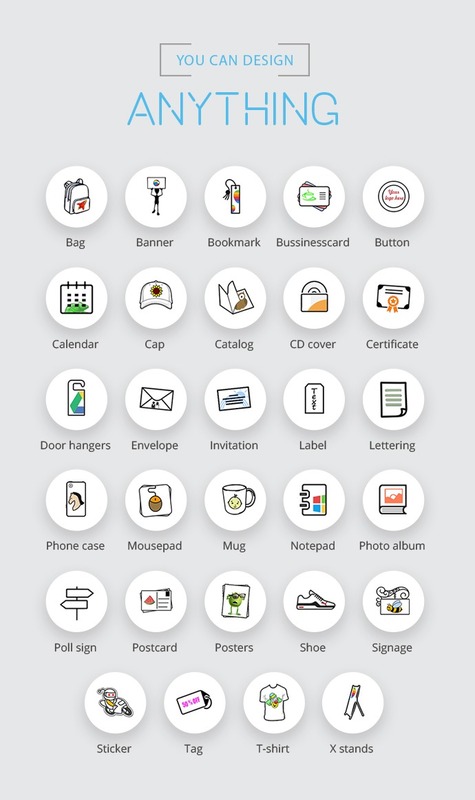 Step 3: Create and customize the design: Click on main menu icon to choose design tools as add text, add art, add an image, free drawing and add QR code to design as your expectation. At the same time, you can customize layers through tool icon. Step 4: Preview the design with zoom and view function. Step 5: After finishing your design, click on "Save" button and add the product to cart. Step 6: Approve Design: The shop owner will consider and send an email notification to you to inform that your design is accepted or rejected. If your design is rejected, you have to re-design and send a new design to shop owner. Step 1: Installing this module: Unzip the installation package and copy all folders to your Magento root. Then, you run command line: upgrade, deploy and clean. Step 2: Integrate Online Design for each product: In the admin panel, you click on ONLINEDESIGN -> click on Products of Manage Designs. You filter to find the product you want to enable design here -> click on "Manage Design" in action column -> click on "Enable Design" check box and then choose the design image, customize the design area size, create the design template ...in the "Design Setting" tab. Finally, you click on "Save Online Design" button. Step 3: Color Management: In the admin panel, you click on ONLINEDESIGN -> click on Colors of Manage Colors. You can add, edit and delete design color here. Step 4: Font Management: In the admin panel, you click on ONLINEDESIGN -> go to "Manage Fonts". You can add, edit and delete the custom fonts & Google fonts here. Step 5: Art Management: In the admin panel, you click on ONLINEDESIGN -> go to "Manage Arts". You can add, edit and delete the art categories and arts here. Step 6: Extension Configuration: In the admin panel, you click on ONLINEDESIGN -> click on Configuration. You can configure some things here as turn off/on the module, upload file size, text, clipart, image... Remembering Save Configure after each change. Step 7: Go to the front-end to view changes. Create the customizable design for any products: Allow your customers to create designs on any products as T-shirt, mugs, business card, bags, and much more. You only enable the module for any products you want on your Magento website. Easy to use the design tool as Add Text, Add Art, Add Image, Free Draw and Add QR code. 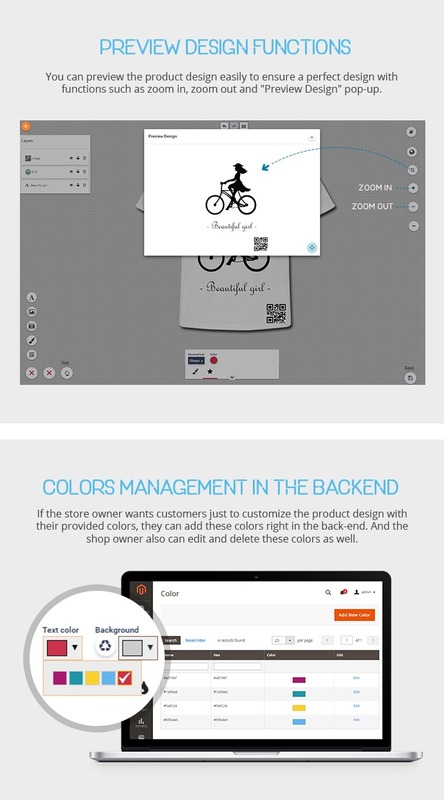 Colors management in the backend: If the store owner wants customers just to customize the product design with their provided colors, they can add these colors right in the back-end. And the shop owner also can edit and delete these colors as well. Arts management in the backend: Your customers select arts from clipart library which are added by the store owner in the Backend. The store owner can add the unlimited arts and manage them as well in the Backend. Orders management in the backend: The Orders of products included design will be managed separately right in the backend. The store owner can view design image for each order, approve design or not and download the design image and output PDF. Fully responsive: Your customers can design on any devices such as desktop, tablet, mobile, etc. because this module is fully responsive. A system allows you add text with many colors, fonts, and other sizes. Moreover, you can curve text in their design easily and edit anything of text as the shadow, pattern, rotate, opacity, outline, line height, background, etc. There are plenty of fonts being included in Font Category; shopper can find it by pressing ‘More buttons'. Outline's color and size are changeable. 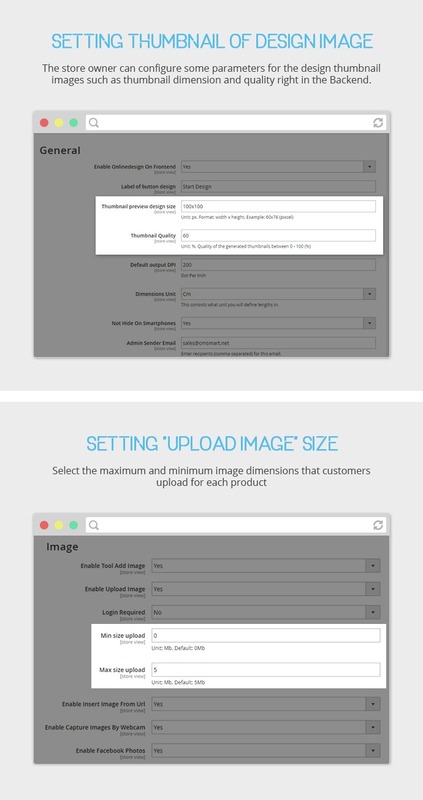 If shopper don't satisfied with sample picture, they can upload images as they want. They also can select from different many sources as Facebook or enter image's url. Uploaded file is typed as PNG, JPG, and GIF. Its maximum size can be adjusted in backend. Picture's opacity can be customized. Especially, you also can use many available brushes to draw; you can create your own signature. Certain buttons are used to quickly change layer's position. Layer can be displayed or hided easily. More tools are included extension as next, zoom in, zoom out... All buttons are arranged clearly for convenient use. 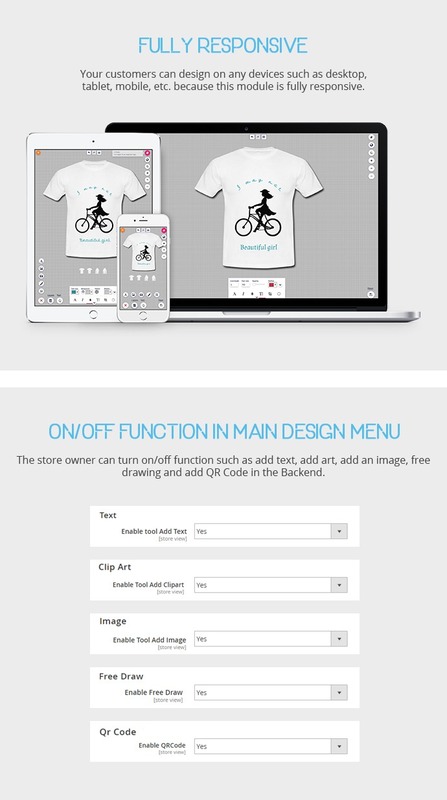 On/Off function in main design menu: The store owner can turn on/off function such as add text, add art, add an image, free drawing and add QR Code in the Backend. Setting thumbnail of design image: The store owner can configure some parameters for the design thumbnail images such as thumbnail dimension and quality right in the Backend. Allow designing on smartphone: The store owner can allow their customers to display/hide "Online Design" function on the Smartphone right in the Backend. 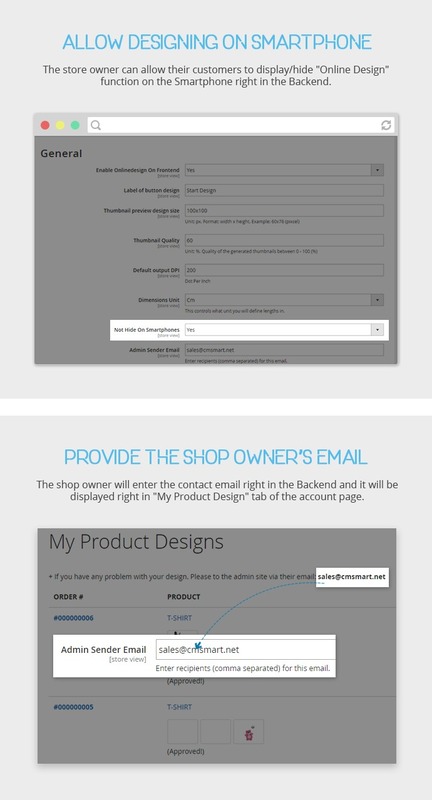 Provide the shop owner email: The shop owner will enter the contact email right in the Backend and it will be displayed right in "My Product Design" tab of the account page. 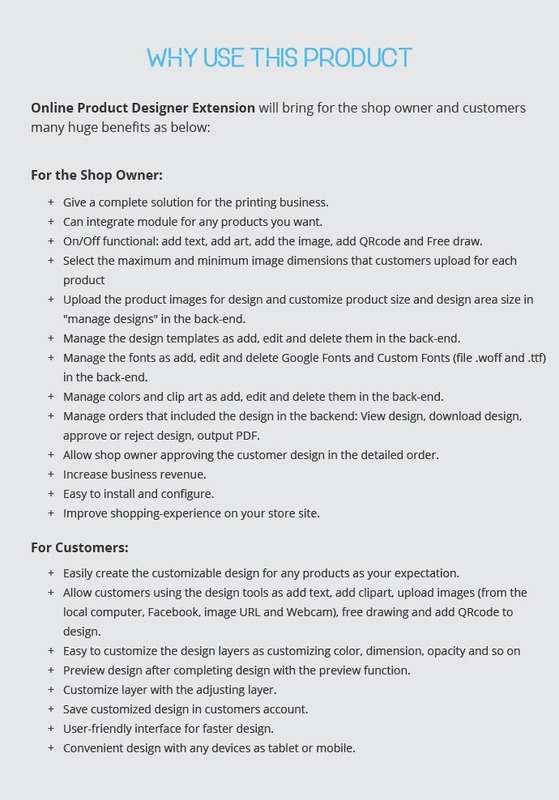 Customer's designs management: All customers' designs will be managed in the customer account and they will receive the approval or reject information here. 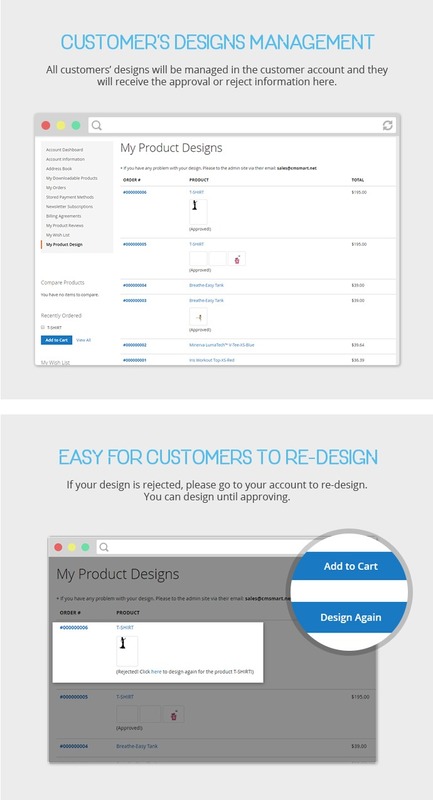 Easy for customers to re-design: If your design is rejected, please go to your account to re-design. You can design until approving. The powerful helpdesk: The customer can easily understand and use all tools with the powerful helpdesk. Design template management: All design templates will be created in the Backend by the store owner and your customers can view their design templates in the Frontend. Easy installation and using: With some simple steps to install and configure, you will set up this extension easily without hassle. Quick support, friendly and helpful. Full and functional extension. Amazing magento extension. Fast and great Support. Thank you. Good Support Provided instant solution. Thanks. It’s very important that your product designer is easily deciphered by your customers as they aren’t going to try forever to get the features. I'm completely pleased with support and product I recieved. Good module! It has more function I have ever thought. So interesting experience when using! It’s very important that your product designer is easily deciphered by your customers as they aren't going to try forever to get the features that are too complicated to use. Good! Your item means a lot to the development of my business, it's like I reach a new level in serving printing service. My customers are really happy and interested in the feature that allows them to design. Hope you will update it frequently! A great magento 2 extension for a very good price! Also the support team is there for you when you have questions. Deserves a 5 star rating! This is really a great extension with tons of features. I've spent a lot of time for searching and comparing this kind of product. Finally, I found that this ext's exactly what I want. Above and beyond thrilled with the results.Everything vent super easy. No problems have occurred since I applied this extension. Very good and useful items. 100% recommend! wonderful feature and very fast response from support team, thanks! This is a powerful extension for printing shop ready to use on your server without any string attached. I love it. my customers love it. Keep up the good job! It deserves 5 stars. Excellent support as well. Deserves 5 starts, Thank you. Great extension that exceeded expectations. Absolutely worth the money!
. 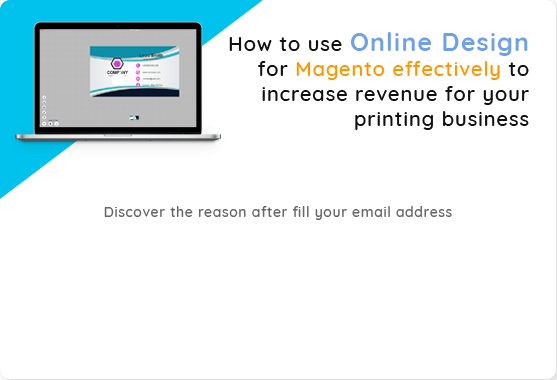 I would like to say that I got acquainted with your Magento online design tool for accomplishing printings on diverse styles' products, including T-shirt, stickers, caps, business cards, etc. It works so great and creativity seems to be unlimited with this tool. A great addition to any print or art related ecommerce store. Great functionality and easy for the end user. Also has an easy to use admin area where you can set up your templates and other options. The support is also incredible! I love this product! Top notch work and help. I love this product and the support is great! After install and use it, just one word for this product "Awesome". My printing site becomes incredible, my customers satisfy so much. It deserves the time I have to wait for your product released. Thumbs up and give your 5 stars! How do I set up the product so I can have multiple versions with different designs in the cart without having to go to check out? Can the icon of those tool buttons can be change or change the button size to bigger? Yes, you can change the button size bigger or smaller as you want in the CSS file. Is it possible to create a order for a product with 600dpi resolution and download in JPG format? Yes, you can do it so don’t worry about that. Can you give me the authority to test your demo back end? Can I install our products on multiple domains? You can install it on many domains as long as you purchase the corresponding domain licenses key. Auto Renewal Payment: with this package, you have 3 or 6 months to receive our support, download and upgrade FREE. But, after 3 or 6 months you only pay a small recurring fee for each 3 or 6 months, you DON'T need to buy the product again. Standard Payment: You only pay ONCE for this payment, you will receive our support, download and upgrade free in 3 or 6 months. But after 3 or 6 months, if you want to upgrade, download or support, you HAVE to buy again. Can I limit the designing tool for my customers such as give them the option of uploading photos in the specific size and no option for drawing? Our plugin have many options to show/hide design tools, upload image size, limited color... That options apply for all products. You can see and configure this function in back-end. Do the customer’s design need to be approved? If yes, how is the approval process is done? After customers checkout with their design, admin can approve or reject that design in the details order page. Is it possible to create a template using a SVG file with mapping? Can we create design areas with other shapes such as circles, triangle, etc? Default area is square or rectangle so you can combine with overlay image to create other shapes. 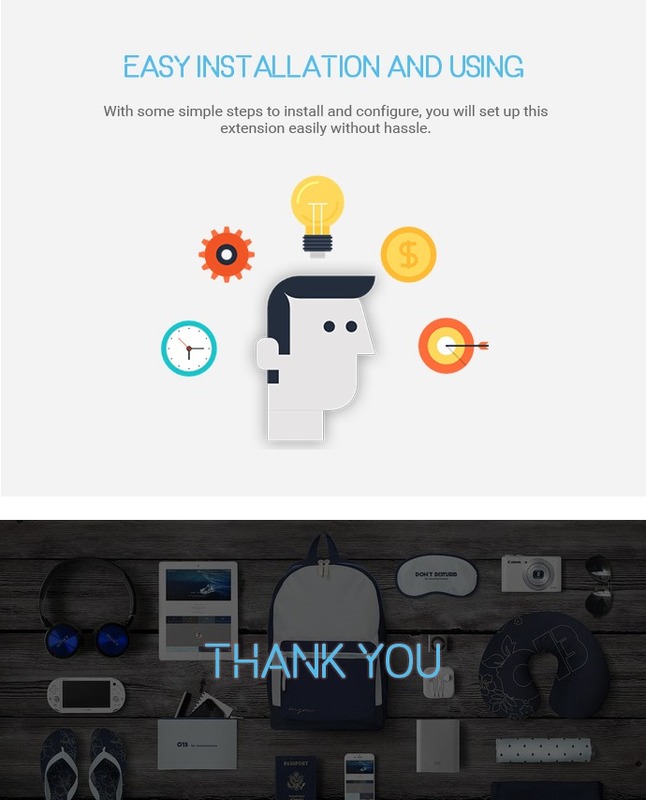 Our plugin saves the last design of customers, they will be able to continue design their last design whenever they come back. How is the quality of end result from the design? will it be high resolution? What format will the design image be? Online designer is for a single type of product? Or to use it for all kinds of industry? Yes, you can do it. We provide template for many kinds of product. But with some special items which you want, feel free to ask us. Is it possible to set the height and width of the designer stage? Yes, you can set the height and width of the designer stage as you want. What would be the renewal cost? So i have to pay this cost every 3 months? Or can I pay it annually? The renewal cost will be 65% of the product price. Many customers use that standard version and almost all of them come back and use our recurring service because of its benefits. After a customer order we can send a series of automated emails? Order confirmation, order status, mail feedback? I wanted to know if Any renewal cost is applied on this product? I wanted to know if Any renewal cost is applied on this product? Like after making the standard payment do I have to pay for renewal by year end? what would be the renewal cost? So i have to pay 39.93$ every 3 months? Or can I pay it annually? Ya, our recurring service costs 39.93$ each 3 months. Or you can choose the standard payment and renewal whenever you want. 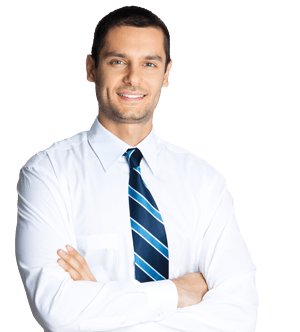 But many customers use that standard version and almost all of them come back and use our recurring service because of its benefits. we want to give our customers the option to design and order multiple versions of the same product at once. But when adding a 2nd version with a different design to the cart, both elements are combined to 2 copies of the 2nd version, while the first version of the design is lost. How do we go about configuring a product so it is possible to order multiple designs of the same product at once? At this time our extension just allows designing 1 product at once, after check out it will be saved in your account so you can start designing another product. But if you want to design multiple products at once you can open multiple tab. for example designing gift cards. I want to make cards for multiple people that each have their name on the card. So I design the first card, put the first name on it, save it to cart. Then I open the designer again, change the name, save it to cart, and suddenly I have 2 gift cards with second name in my shopping cart. How do I set up the product so I can have multiple versions with different designs in the cart, without having to go to check out for each design individually? Using multiple tabs doesn't help, only the latest design is saved. This behavior is very counter-intuitive, since we expect our customers to create multiple designs in a single order, and the result is not at all what we want. 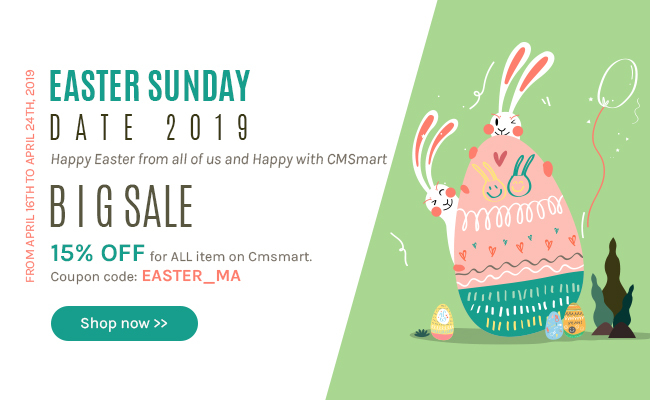 At this time our extension allows customers design and add to cart 1 product at once, after add to cart this product will be saved so they can continue designing other product. when they finish designing they can check out with all product in their cart. we want to allow our customers to order multiple designs of the same product at once. It is perfectly fine if they can create 1 design at a time, but the problem is when creating the 2nd design, the first one is lost forever. At this point the first design is lost. Is it not possible to create multiple designs with this extension? Yep, our extension allows your customers to create another design after add to cart the older design. Not Getting Support For "ProductDesignerExtension"
I have purchased your product “Custom Product Designer”. It is not working at all. However I have applied all the steps given by you in the documentation. It 's only showing at the bottom of the page how to design a product instruction. We aren't getting “design” button below “add to cart” button. So please fix this problem as soon as possible because it is too late now. And if it is not possible from your side then refund my money so that I can buy some other extension. Thank you so much for your purchasing our products. Please follow your ticket and our developer will help you resolve your problems. None of your developer supported me till now and I believe that they cant do in future times also. Please let me know whether your team can solve it or not and if they can't then refund my money back. Please follow your ticket, Susan Lay and Victor have just feedback for you. What kind of host is required and is other software required to install onto the server? Thank you so much for your interested in our products. 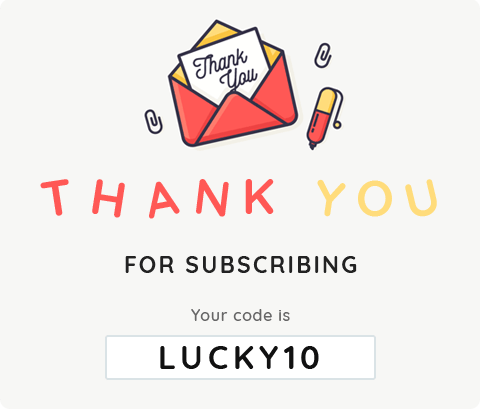 I am happy to support you. Our module don't requires much in the server, when you install successfully, our product can work in this. I am happy to answer your question. Our product can design different things. But you should see our demo to understand all features. Could you use our demo? If you have any questions, don't hesitate to contact with me. Our Customer is a printing company which is print fonts for store windows. The website user should be able to change the size of the designer stage to see how big are the words and text in ratio to his store window. Yes, you can set the height and width of the designer stage. Feel free contact with me via email janet@cmsmart.net if you need. I have try the demo front end, I have a question. Can the icon of those tool button can be change or change the button size to bigger? Yes, you can change the icon of those tool button or button size to bigger. If you have any problems, feel free to send email for me. My email is janet@cmsmart .net. I am willing to answer your question. Frontend Demo Not Found Error. I would like to try the front end demo. It keep show Not Found error. I have been try 2 days, still same. I have checked our demo after you told. But it is working fine, could you check it again? Please let me know if you have any problems. Or you can send email to janet@cmsmart.net. This is my email, I will answer you immediately. Where i can see backend demo? The link sent to other users don't work anymore. I need to check how jpg is rendered to see if its suitable to print invitations. If you have any problems, feel free to contact with me via email: janet@cmsmart.net. The credentials posted for this backend link do not work anymore. What are the new credentials? If you have any confuses, don't hesitate to contact me via Skype for fast discussing: Vincent_4281. can the feature and outlook of the design tool be modified and customized? I would like to change the feature a bit here and there according to my biz model. Is it possible? and can you help do that? + Add function “Create grid” for design area. + Add function “Undo and Redo” for design block. + Manage design templates in admin (add new template, edit template, delete template). The customers can choose templates on the frontend. + Support responsive in the design page.